The Russian Foreign Minister warned against taking sides in the Syrian conflict now as it can put the nearing peace negotiations under threat. Russian Foreign Minister Sergey Lavrov believes Western politicians have started to realize that overthrowing Assad’s government might lead to a worsening of the Syrian crisis. This shift in the attitude is due to the rise of jihadists in Syria and the threat of the country turning into a caliphate, he said in an interview with RT. What worries Sergey Lavrov is that his “Western colleagues are trying to “flirt” with the so-called Islamic front”, which has been struggling for influence with the Free Syrian Army. Lavrov believes the Islamic front could be ideologically close to such Al-Qaeda-linked jihadist groups as Al-Nusra. Lavrov has doubts that the Syrian National coalition is in control of all of the rebel groups, currently fighting against Assad, and could represent them all at the Geneva-2 talks. The issue of the humanitarian crisis in Syria has been exploited, just as the issue of the chemical weapons before it, to lay all of the blame on Assad’s government, Lavrov believes. The Foreign Minister has warned against taking sides in the Syrian conflict now as it can put the nearing peace negotiations under threat. Lavrov also said comments from some Western leaders that Assad doesn’t represent anybody in his country were premature. 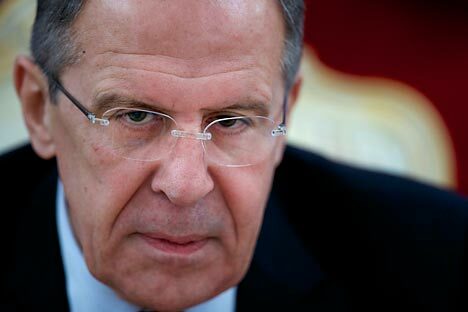 “ A large part of the population is for Assad for various reasons, not just because he enjoys the love of the people, but because big groups of people depend on him, and not only minorities, even the Sunni,” said Lavrov, adding that many are afraid of being deprived of their business should there be a violent change of power. Lavrov also said comments from some Western leaders that Assad doesn’t represent anybody in his country were premature. “A large part of the population is for Assad for various reasons, not just because he enjoys the love of the people, but because big groups of people depend on him, and not only minorities, even the Sunni,” said Lavrov, adding that many are afraid of being deprived of their business should there be a violent change of power. The minister believes a country is free to choose its own way of democratic development in line with its history and values and based on international law. Lavrov is strongly opposed to attempts by a group of countries to try and impose their own set of “ambiguous values” on others. This is not democracy, but democratizing, which leads to societies growing destabilized, he contended. An estimated one million Christians have been forced to flee their homes in Syria as a result of the civil war. As an example of what the religious community has to endure, Sergey Lavrov recalled a recent episode when nuns were abducted by Syrian rebels from a convent in the predominantly Christian town of Maaloula. “According to the information we get from the Christian communities in the region, they are deeply worried by what’s going on, as their 2000-year domicile in the Middle East appears to be at stake”.